The job of an air filter is pretty simple; to keep the air entering the engine as clean as possible. Though the process is simple, allowing your air filter to get clogged with dirt can have a serious impact on your engine’s performance, and even it’s life span. As you drive about your engine breathes in the air that passes by. Sometimes this air can include dirt, debris, bugs, etc. Your trusty air filter catches these things while letting in fresh, clean air into the engine. All is well, your engine is happy and the air filter is doing its job. After miles and miles, the filter begins to wear down and all the dirt and debris starts to clog the filter. A dirty air filter means that your engine has to work harder to do its job, this puts an increased load on the engine and on the gas pedal since it’s harder to accelerate as before with a clean filter. It’s typical to see diminished performance and fuel economy with a dirty filter. In the worst case, the air filter can get so dirty that it stops doing its job and allows dirt to flow into the engine. This dirt then makes its way into the oil, and given enough time, could start to do some damage. 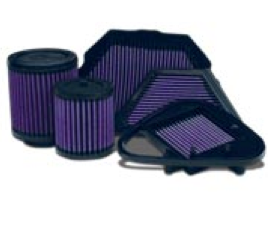 Replacing your air filter can restore your engine’s performance and fuel economy. Drop by any of our service departments to have your vehicle’s filter inspected or replaced. Posted on March 12, 2012, in Automotive, Maintenance Monday and tagged acceleration, air, engine, filter, Fuel-Economy, health, maintenance, Maintenance Monday, oil, performance. Bookmark the permalink. Leave a comment.